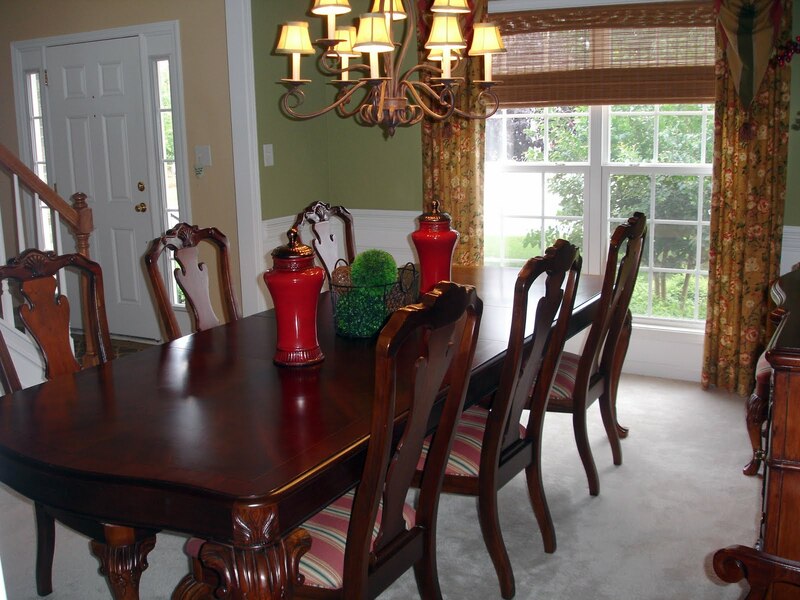 Our dining room is located to the left of the foyer as you enter the front door. This view is looking from the door to the kitchen. Here is the view into the room from the front door. I’m on the hunt for new lamps for the sideboard. I sold the ones that I had on craigslist. I’d like to change the shades on the chandelier too. I picked up the ceramic urns at HobLob when they were 50% off. Then I grabbed the wire basket from their clearance shelf for a song. The decorative balls in the basket were either made by me or collected over time. I couldn’t get a great shot of it, but the room has a tray ceiling that has been painted and glazed. Just like the living room, I chose to use woven wood blinds with the draperies in this room.Another reason for repeating the woven wood blinds in here is because both the living room and dining room are on the front of the house. Using the same type of blind, drapery style and drapery lining gives a uniform look from outside the house. 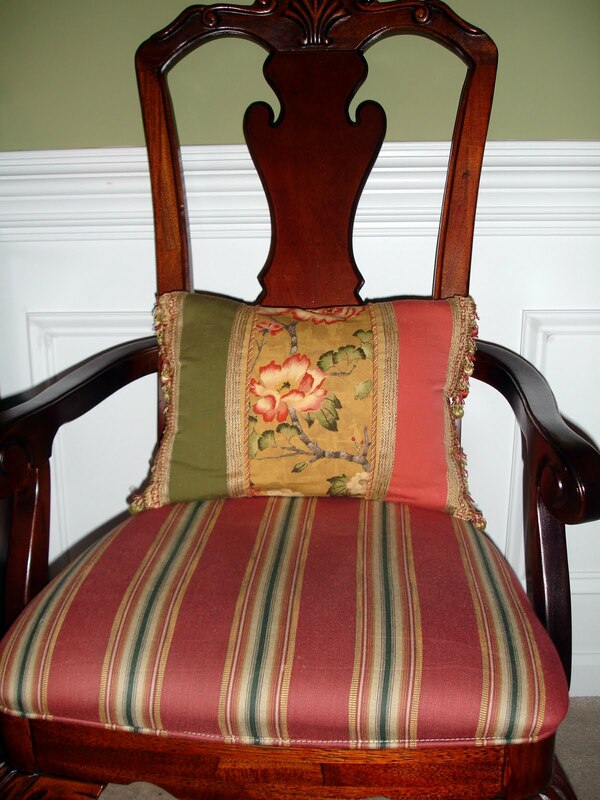 When I ran across this fabric for the draperies it was instant love! I love to mix patterns within a space so the striped fabric for the pendant shaped “skirt” was a natural fit. I used big, chunky drapery hardware in here and in the living room because the ceilings are 9′ tall. Anything smaller would have been lost. You can see that I hung the drapes close to ceiling to emphasize the ceiling height even more. The pillows in the chairs flanking the sideboard are made using both of the drapery fabrics. Too bad you can’t really see the cute fringe on each side. 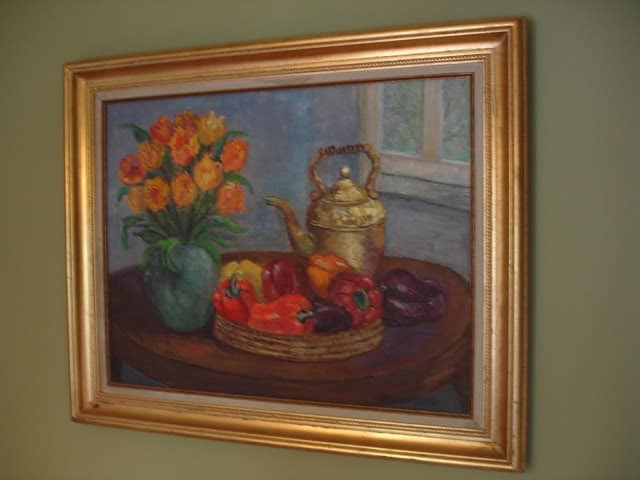 The other side of the room is hard to get a good shot of because so many things are in the camera’s line of sight, but I wanted you to see that another one of my Auntie Syl’s beloved paintings made it into this room too. The wall urn is one that I put together several years ago. I’ve contemplated taking it down. What do you think I should do? 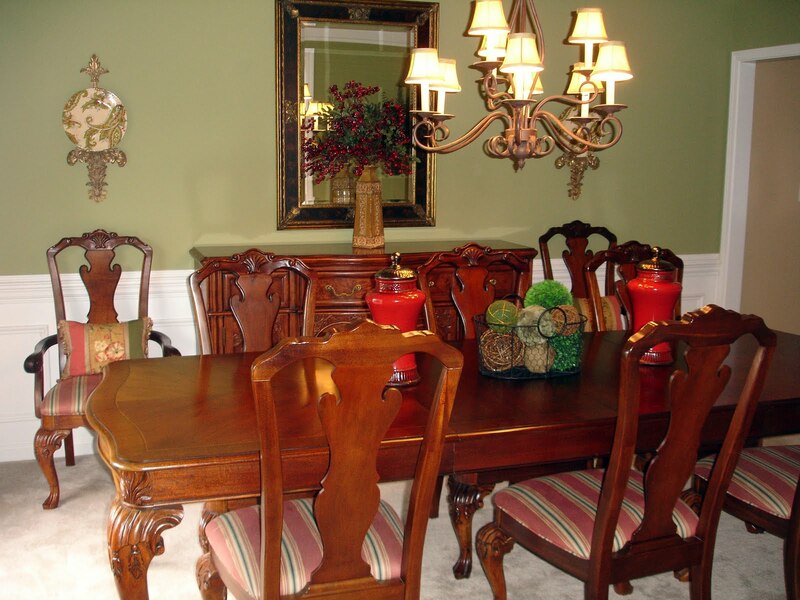 And…unlike the living room, the dining room does get used several times each year. Holidays, family gatherings and the like. 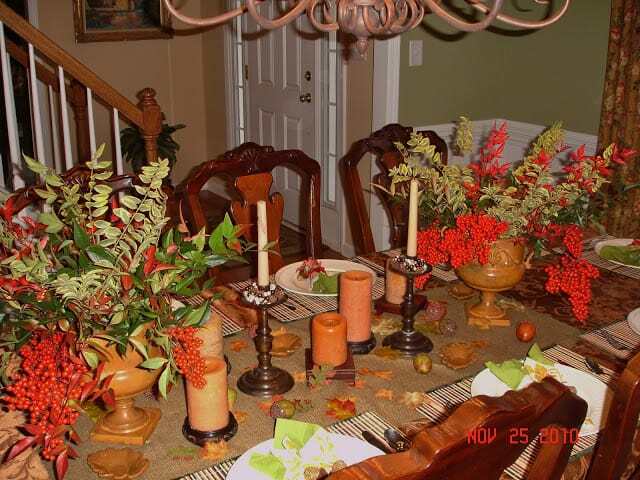 Here’s the table set for Thanksgiving dinner last year. Thanks for stopping by! I hope you enjoyed the tour. You can tour more of my home by clicking here. Love your green walls! Your dining room is beautiful! this is gorgeous, its so timeless, great choice of colours. Really pretty room. I could live in there forever. Love the red urns on the table–a pretty contrast to the dark wood. What a lovely dining room you have. 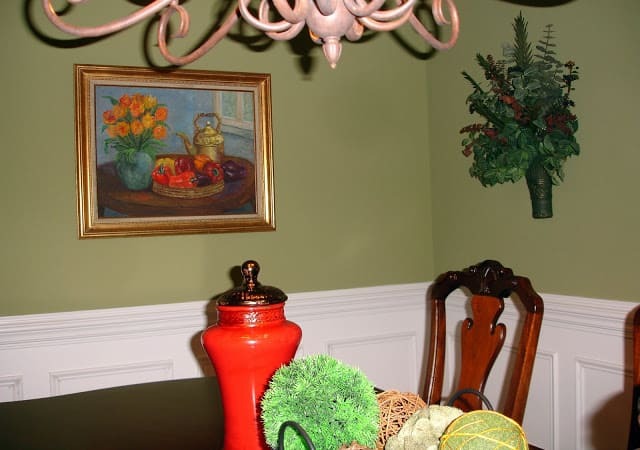 The green color on your walls looks alot like the green I have on my dining and living room walls! Love those pretty draperies you’ve made and the urns on your table are just gorgeous. What a beautiful home you have. A very pretty dining room. Love your colors! 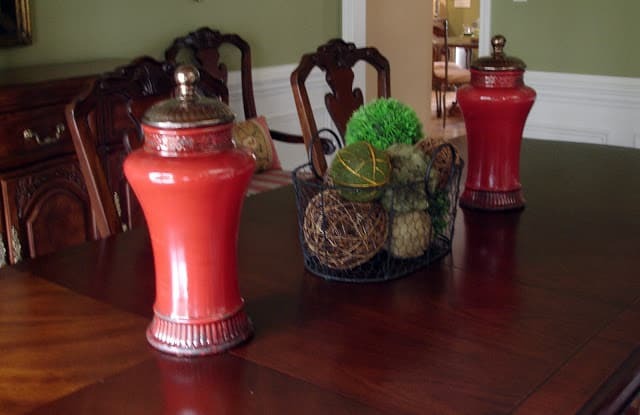 Very nice decor in the dining room..I would keep the wall urn..I saw it and thought hmm I need to make this…I love the table set for Thanksgiving..I am new to yoour blog and look forward to looking around and reading more. I love, love, love your Aunt’s painting. And I say keep the urn, I think it adds texture to the room. Beautiful dining room! Very traditional and classic looking. 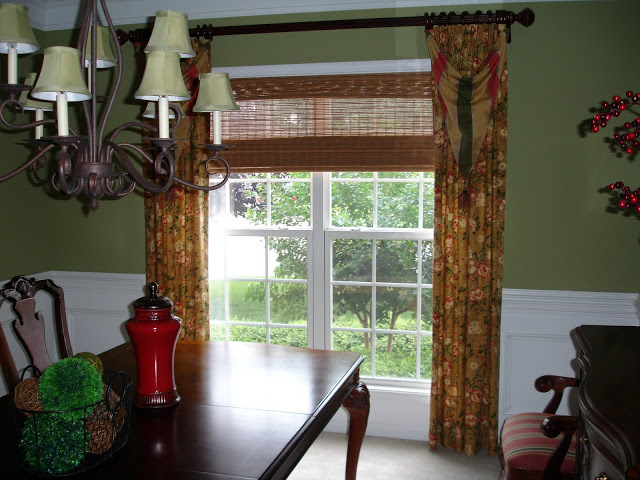 Love your window treatments and your gorgeous furniture … lovely color palette, as well! Your dining room is wonderful. What kind of new shades are you considering for the chandy? I’m thinking of some black ones for mine. I agree about your fall table being lovely, too. Thanks! @Helen’s DecorHi Helen. I’m not sure exactly what shades I’d like to change to…something a little more updated I think. Steinmart usually has a pretty good selection. I love black shades – very classic – but I’m afraid it will make my dining room too dark. Dim light is already an issue for my 88 yr. old mother in law. 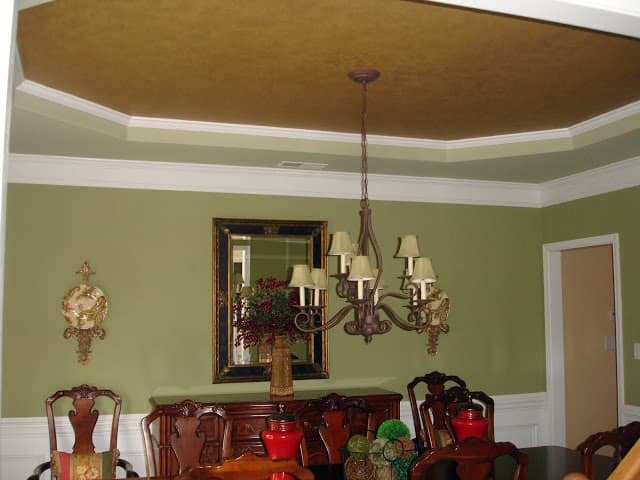 Love the tray ceiling! Lovely room. I agree totally! 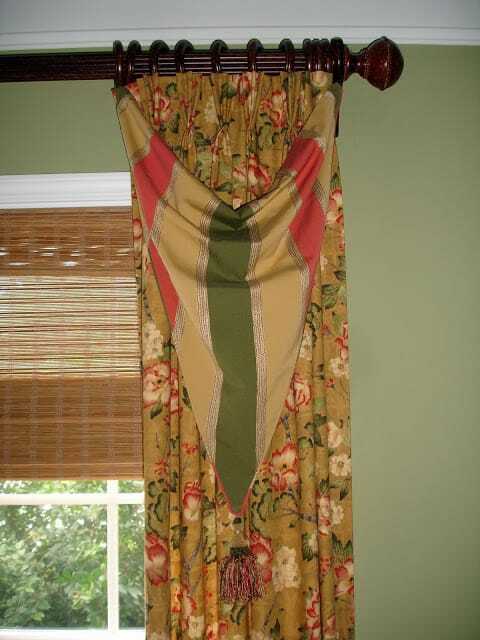 Hang those curtains high for greater impact. Thanks so much for joining the “room by room” series.